Are you a yogurt fan? My husband and son love yogurt so much so that it's a staple in our fridge for their breakfasts and snacks. I, on the other hand, am not a big yogurt fan. The exception is a special yogurt - Ellenos - which is found in Seattle, WA. That's the only yogurt I could eat by the buckets and I even contemplated having their yogurt shipped to me just so I could get my fix... until I learned the shipping costs were more than the cost of the yogurt! So I continued on with life without yogurt, only to buy it for my boys to enjoy. And then my Instant Pot changed all that. I never thought I would say it, but my love for Ellenos yogurt has been swayed by the creamy, rich and amazingly delicious yogurt I can make at home using my Instant Pot. 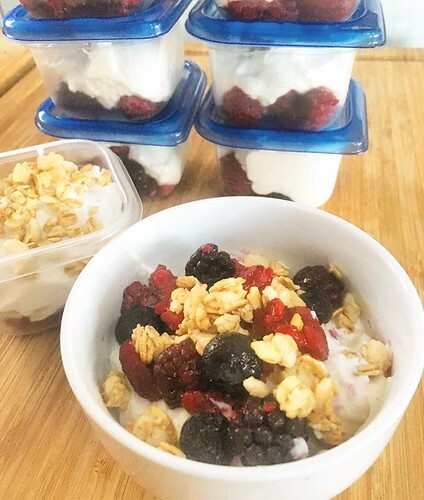 This low fat Greek Style Yogurt is flavored with vanilla bean and honey and served with mixed berries and granola. Heaven! I read a few IP yogurt recipes but found them to be so over written and complicated. So I tested things out myself and came up with the following recipe which is much easier and simplified. First off, this recipe is for the IP DUO that has a yogurt function. I'm not sure if yogurt can be made in any other pressure cooker or IP version, but Google may be able to help. Before attempting this recipe, please plan ahead as it takes roughly 10-15 minutes to warm the milk up to the right temperature, 10-15 minutes to cool the milk down to the right temperature, 10 hours to incubate and 6-8 hours to strain before enjoying. Yes, it seems like 16-18 hours of preparation/waiting time, but I assure you it is well worth the wait! Add the milk into the IP pot. Secure the lid on the IP. Valve can be set to either SEALING or VENTING - it doesn't matter because the yogurt will not be cooking under pressure at any time during this process. Press YOGURT.... "BOIL" should be reflected on your display. If it does not, hit CANCEL and YOGURT again, if not twice until BOIL is reflected on your display. Once the display reflects BOIL, allow a few minutes for your IP to warm up the milk to a scalding temperature. The IP will beep when it has finished. Remove the lid off the IP and you'll notice the display will reflect "YOGT." No need to press any buttons yet. Using your thermometer, check the temperature of the milk. The milk must come to 180-185 degrees. - If the milk has NOT come to 180-185 degrees, secure the lid on the IP and repeat the previous steps to allow the milk to come to temperature and check again. Once the milk has reached 180-185 degrees, fill the large bowl with cold water and ice cubes. Set the IP pot with the milk inside the bowl to cool down to 100-110 degrees.. As it cools, carefully whisk the milk and remove any "skin" that has formed to ensure a smooth yogurt. Check the temperature of the milk to see if it has come down to 100-110 degrees. Place 2 tablespoons of any store bought yogurt with live active cultures into the 2 cup measuring up. You may be asking why you need yogurt to make yogurt. The reason is similar to making sourdough bread. A little starter yogurt with live active cultures will help make more yogurt. I know it may be tempting to put the entire small cup of yogurt into the measuring up, but 2 tablespoons is plenty. Too little yogurt will yield in loose or runny yogurt. Too much yogurt will yield in curds and quick separation from the whey. Using your ladle, ladle some milk into the measuring cup over yogurt and whisk together until the yogurt has completely thinned out into the milk. This is the tempering stage where we are introducing the live cultures into the warm milk. If the milk is too warm (over 110 degrees), the live cultures will die and result in milky yogurt. If the milk is too cold (under 100 degrees), the live cultures will not thrive enough to result in thick yogurt. After the yogurt has been blended with the milk in the measuring cup, transfer the mixture into the IP, whisking to combine. Wipe the outside bottom and sides of the pot and return back to your IP. Secure the lid on the IP. Again, the valve can be set to either SEALING or VENTING - it doesn't matter because the yogurt will not be cooking under pressure at any time during this process. The display still should reflect "YOGT" since you removed the pot from the IP. Now, press ADJUST and using the "+" or "-" set the display to reflect 10:00, which is 10 hours. This is called the incubation period, when the live cultures we've introduced into the warm milk will work its magic! You can set it for a minimum of 8 hours, but it may be runny and mild. I found 10 hours to work perfectly for the right texture and tang. After the 10 hours is up, your IP will beep. Remove the lid from your IP. Using the same bowl used to cool down your milk previously, set a fine mesh strainer to sit inside it. Line your strainer with coffee filters, enough to cover it completely. Transfer the thickened milk into the coffee filter lined strainer set over a large bowl. Cover with plastic wrap and set in your refrigerator for 8 hours (or overnight). After the mixture has had enough time to strain, the result is thick, creamy Greek Style Yogurt! Transfer the thickened yogurt into a large bowl and stir in vanilla extract and honey to your tastes. You can now pack your yogurt into containers and top with your choice of toppings. We like fresh or frozen mixed berries, granola and honey, sliced bananas, jam, whatever is on hand! This yogurt will keep for up to 2 weeks in your fridge.